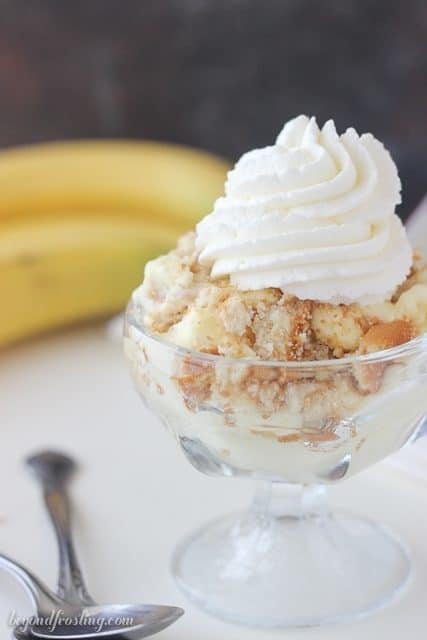 This Magnolia Bakery CopyCat Banana Pudding is the real deal. 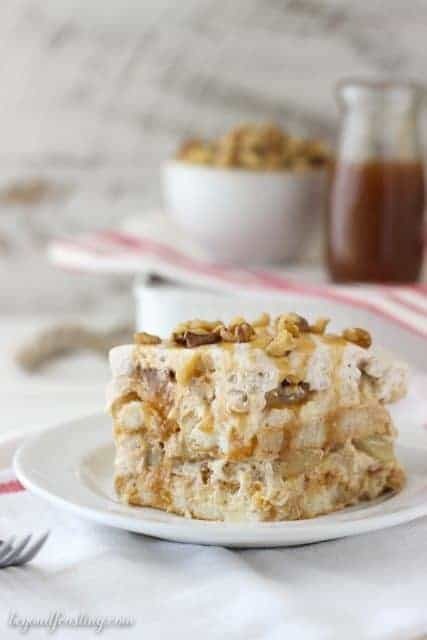 Light and fluffy mousse layered with sliced bananas and Nilla Wafers. Have you guys updated your phones to the new ios? Don’t worry, we aren’t here to talk about cell phones today. BUT with the new ios update, my phone now tells me how many minutes it will take to get certain places, without me even really knowing where I am going. For instance, I was home all day Monday. I got in my car at 3pm and it told me 20 minutes to drive to work. At 3pm on a Monday, how did my phone KNOW that I was getting in my car to go to work (which I was). I mean really? The same thing happened today when I went to go to work at 8:30am. Is that not a little bit creepy? Okay, we’re done. My trip to New York feels like it was light years ago. 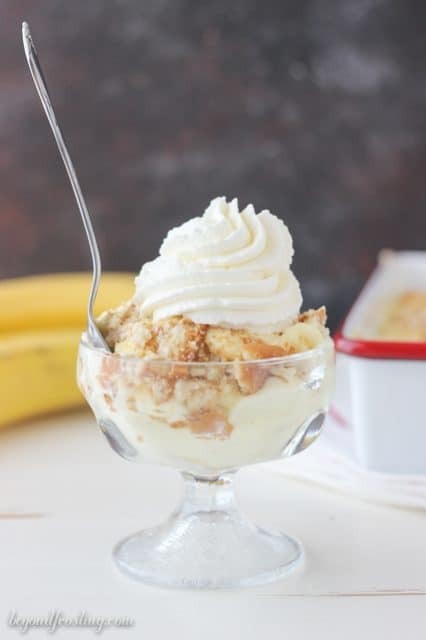 I went in early August and I’ve been waiting to share this Magnolia Bakery’s Copycat Banana Pudding since I got back. 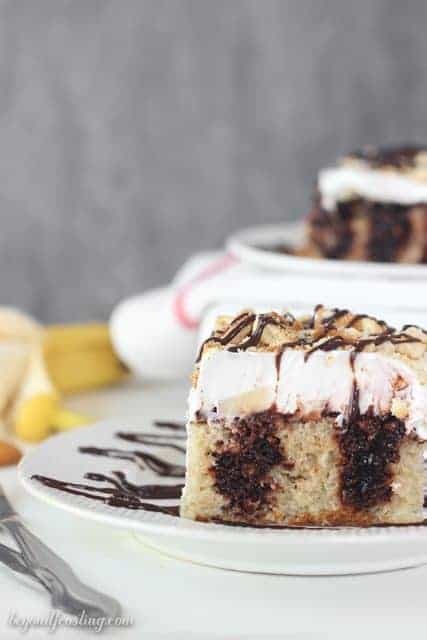 I did promise you guys this recipe back when I made my Chocolate Banana Cream Pie Cake. This is technically not the “true” copycat of the Magnolia’s Bakery recipe that they published in their cookbook. It’s an adaption, a mild one but still an adaption. The thing that makes their pudding so swoon-worthy is the sweetened condensed milk in the pudding. Oh heck yes! I have to be honest with you, I didn’t even know Magnolia’s banana pudding with a thing until after I got back from New York. We just so happened to walk by their bakery, and I stopped inside. The line was kind of long and we had somewhere to do, so I just grabbed a couple drinks and the banana pudding sign caught my eye. I ordered one to go and ate it as we walked back to the hotel. The first bite, was much different than I expected. It was more mousse-like in texture as opposed to pudding. It was so light and fluffy, like THE fluffiest mousse ever. 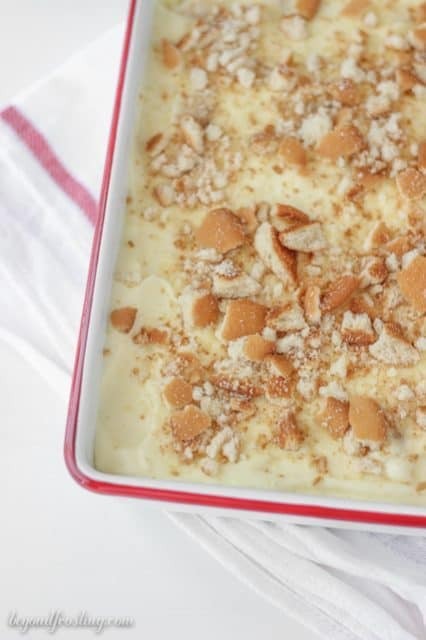 The pudding was layered with plenty of vanilla crackers, which were soft and cake-like. I continued to devour my pudding, I kept saying, I should stop eating this, soely because of ALL the food I ate that day in NY and I still had to get myself into a dress for the bachelorette party that night. But I just couldn’t stop. When I got home, I Goggled the banana pudding and found there were dozens of copycat recipes, so it was a bit of a no-brainer for me to try it. I pretty much had to put this dessert away with a lock and key, as I caught myself stealing a spoonful over and over again. I am certain this will happen to you if you try it. Certain. In a medium-sized bowl, combine sweetened condensed milk and milk and beat on medium speed until the milks are well mixed. Add the instant pudding to the milks and beat until well combined. Pudding must be refrigerated for 3-4 hours until completely firm. Put your mixing bowl and wire whisk in the freezer to help it get very cold. This is optional, but something I usually do. Beat heavy whipping cream on medium-high speed. Slowly added powdered sugar, increasing speed to high and beat until stiff peaks form. Slowly fold whipped cream into pudding until combined. Use a Ziploc bag to crush Nilla Wafers. In a 9-inch square pan, put down a layer of parchment paper on the bottom of the pan. Sprinkle the bottom layer with crushed Nilla Wafers. 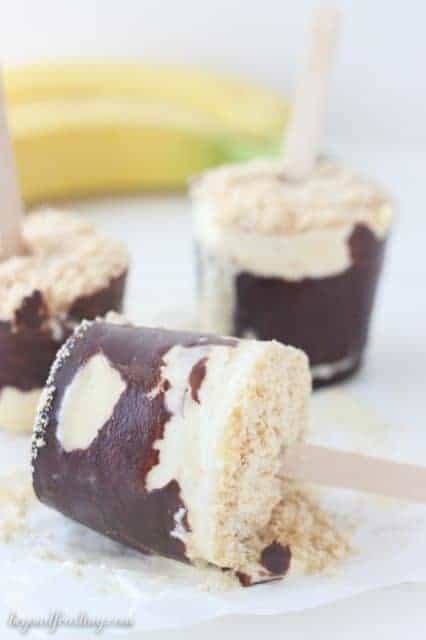 Slice bananas and place a layer of sliced bananas over the wafer. Pour half the pudding in the pan and gently spread over the bananas. Sprinkle another layer of wafers and bananas and top with remaining pudding. Sprinkle the top with any leftover wafers. My New York office is right next to Magnolia and that pudding is the only thing in NYC besides Halal Guys that I would wait in line for! It is heaven in a bowl. This would be dangerous to make! whao…kinda creepy! Like on the maps app or where does it tell you?! 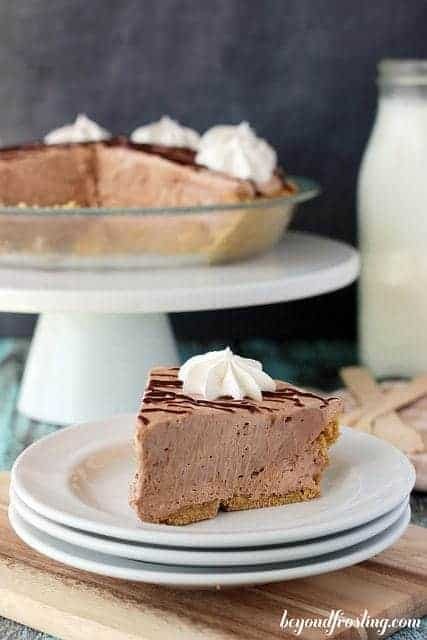 And while I have never had Magnolia Bakery’s pudding I definitely need this one in my life! 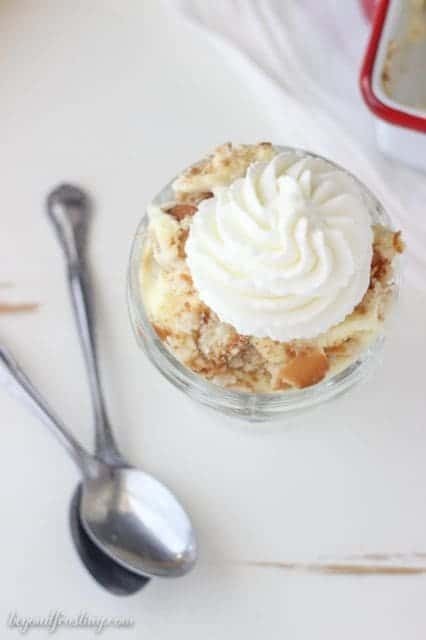 Oh yea, SCM in banana pudding is the JAM! Love this! 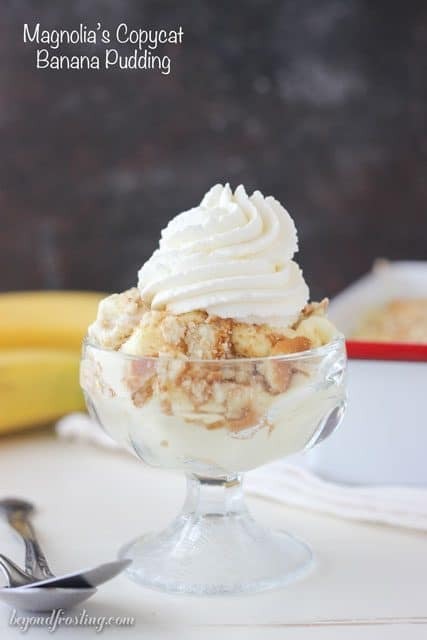 I love banana pudding…this looks incredible! So pretty too! Their banana pudding is BONKERS. I mean, BANANAS. I downloaded the new iOS but I haven’t noticed that feature yet. That is creepy! 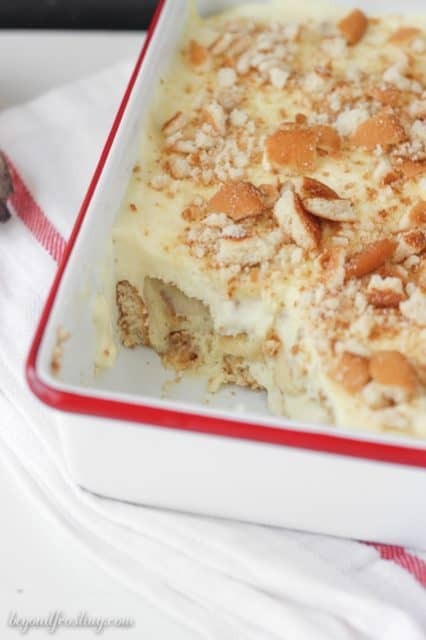 But this banana pudding looks incredible. 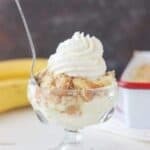 I love banana pudding and can’t wait to try this copycat version! Making pudding with sweetened condensed milk sounds like an ingenious idea!